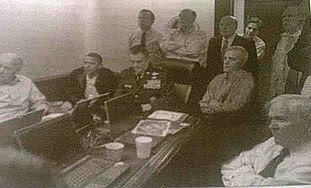 A Yiddish Haredi Brooklyn newspaper, Der Zeitung, has printed a revisionist version of the iconic photo of the White House staff watching a live telecast of the assault on Osama Bin Laden's hideout in Pakistan by removing Hillary Clinton and a female staffer from the picture. 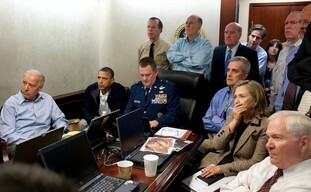 The photograph showing President Barack Obama and staffers in the White House Situation Room carefully watching the raid in progress by US forces in Pakistan on the bin Laden compound last Sunday has been published far and wide. One Hassidic paper in Brooklyn, however, has chosen to alter the photo – excising Secretary of State Hillary Clinton and another female staffer from the picture. First reported in the blog failedmessiah.typepad.com, the photoshopped picture was published in the Yiddish newspaper Der Zeitung (The Time) on Friday, with empty spaces where Clinton had been sitting and where the female staffer had stood. While Der Zeitung had no comment as to why it altered the picture, many conjectured that it was either because of concerns about immodesty, or strong feelings that women should not be in positions of power. This isn't the first instance of Haredis eliminating photos of women from public display. In October 2009 we posted a story about how a Haredi news blog airbrushed the face of model Bar Refaeli from a clothing billboard in B'nei B'rak. And she wasn't wearing immodest clothing, either. I want to hire the airbrusher for my photography business. Great work. Same thing for Mishpacha and Hamodia. Of course they used non-standard grammar, Anonymous. Otherwise they would have to acknowledge women! i think that Hilary is holding his face "probably a toothache" Would you like to have a picture with a toothache?????? ?